Sandbags are stacked in an Orlando, Fla., parking lot as residents arrive to pick them up to prepare for Hurricane Irma. Cleveland Clinic Florida has been preparing for the worst. As part of the clinic's vetted "hurricane order" protocol, its team has been gathering a four-day supply of essential medications, IVs, food and linens as they brace for Hurricane Irma's impact and potential "full lockdown mode," said Osmel Delgado, chief operating officer of Cleveland Clinic Florida. While the 24/7 emergency department will remain open, its ambulatory clinics closed at noon Friday and appointments were rescheduled to next week. Cleveland Clinic colleagues in Ohio are waiting on deck, ready to help during and after the storm. Cleveland Clinic has secured the construction site of its new hospital tower in Weston, Fla., that is set to open next summer to ensure loose debris doesn't turn into deadly projectiles. At its new surgery center in Coral Springs, also set to open next year, the clinic raised its floor level above code requirements and installed impact-resistant glass to prepare for disasters like Irma. "As you can imagine being the chief operating officer at Cleveland Clinic Florida, many of our preparations have included preparing for the worst," Delgado said. "My biggest concern really is first keeping our caregivers safe so that they can provide care for the patients. That preserves our ability to maintain baseline operations." Going forward, Cleveland Clinic will continue to build beyond minimum code guidelines despite President Donald Trump's recent executive order that eased building regulations in flood-prone areas, the organization said. Less than two weeks after Hurricane Harvey, Hurricane Irma has pummeled the Caribbean, South Florida and Georgia, making landfall in Florida on Sunday. All three Florida Keys hospitals including Fishermen's Community Hospital in Marathon, Mariners Hospital in Tavernier and Community Health Systems' Lower Keys Medical Center in Key West closed Friday morning. So far, Irma has been linked to at least five deaths in Florida and 37 in the Caribbean. While the healthcare industry is better prepared for disasters since events like Hurricane Katrina, hospitals, distributors and government agencies are working in unison to try to protect the region from yet another catastrophic storm. Lower Keys evacuated patients to CHS' Gadsden (Ala.) Regional Medical Center. CHS discharged patients in its Florida affiliated hospitals, where appropriate, and rescheduled elective procedures, CHS spokeswoman Tomi Galin said. CHS has standing disaster orders for supplies and medications with vendors for each hospital to secure at least a week's worth of high-use supplies such as linens, food, water and medications. It has topped off fuel tanks, tested generators and secured huge backup generators transported by semi-truck. Hospital employees and disaster response teams are holding internal preparedness meetings multiple times a day and have put together staffing plans and schedules for activating incident command centers. Hurricane Harvey, which devastated southeast Texas and the surrounding area last week, has helped CHS prepare, Galin said. When Victoria, Texas, lost power to the pumps for the community's water supply, CHS' DeTar Healthcare System loaned two of the hospital's mobile backup generators to the city, helping restore the community's water supply and preserve temperature-sensitive medication at DeTar Hospital Navarro and Citizens Medical Center. "We improve our processes as each storm passes," Galin said. HCA Healthcare, which has 14 hospitals in South Florida and 46 in the state, has evacuated Mercy Hospital in Miami to other HCA hospitals, an HCA spokesman said. HCA is evacuating Palms of Pasadena Hospital near St. Petersburg and the West Pasco campus of Medical Center of Trinity to other HCA hospitals. The system has also closed its four free-standing ERs in Broward and Palm Beach counties. Kendall Regional Medical Center and Aventura Hospital & Medical Center in Miami-Dade County transferred some critical-care patients to its sister hospitals. HCA's emergency operations centers at the corporate office in Nashville and in Florida, Georgia and South Carolina continue round the clock operations, HCA said. HCA's 200-person disaster-response team located in its Nashville headquarters was supporting affected facilities and helping gather additional food, water, medication, generators and staffing. Ascension Health's St. Vincent's HealthCare System is bracing its hospitals for extra capacity if St. Catherine Labouré Manor in Jacksonville needs to be evacuated, Ascension spokesman Johnny Smith said. As of 8:30 p.m. Friday, the only entrance to St. Vincent's hospitals will be through the emergency room. All physician offices will be closed Saturday, Sunday and Monday. Some of the steps Ascension took include preparing supplies of food, water, medications and equipment to ensure 10 days of coverage, providing a "kid's camp" for families of hospital employees working through the storm, and updating agreements with suppliers, vendors, transportation providers and contractors to perform repairs after the storm. 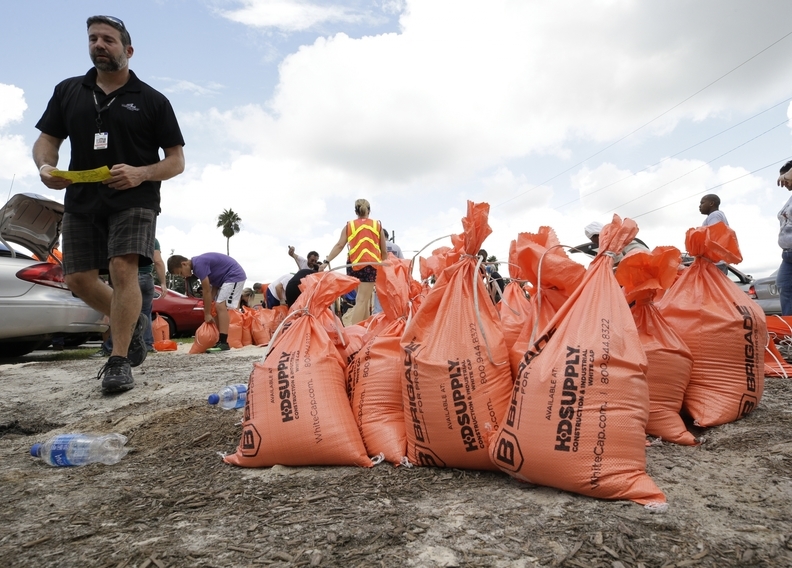 Drug distributor AmerisourceBergen has stockpiled supplies and provided advance ordering options for providers in Florida with recommendations for when and how much product to order, said Peyton Howell, executive vice president and president of health systems and specialty care solutions at AmerisourceBergen. It has people on the ground to prioritize deliveries to hospitals with local couriers, government organizations and the military, she said. During Hurricane Harvey, one of its teams drove to Dothan, Ala., to get chemotherapy products and delivered chemotherapy products to 11 Houston-area oncology clinics, Howell said. Any interruption in cancer and dialysis treatment may have life-threatening consequences. "We anticipate similar dedication from teams in Florida," she said. The group purchasing organization Vizient is working with distributors to ensure they can get supplies to providers, as it did during Hurricane Harvey. It is helping provide access to high-water trucks equipped with giant tires that can endure heavy rain and wind so distributors can get into hospitals, said Cathy Denning, senior vice president of sourcing operations for Vizient. "The capability of moving product in is really concerning with Irma based on its path that covers a fairly large swath of area," she said. It will be all hands on deck as providers, suppliers and local agencies work together to keep people safe. At this point, Cleveland Clinic Florida is prepared as "best as we can be," Delgado said.